Are you open to unleashing your creativity, pumping up your productivity, and creating clarity in your thinking? You'll get all that and more when you do morning pages. Never heard of morning pages? When: I write almost as soon as I get up in the morning. I get out of bed, put on exercise clothes, make a pot of coffee (2 cups, french press), then start. Where: I like to write at my kitchen table, not in my office at my desk. You can write any place that is comfortable for you. Tools: I use college-ruled spiral notebooks that I buy at Target (five for $4). And other blank books, too. I also like a good pen. Length: It takes me 22-25 minutes to write 3 pages. Sometimes I write for longer because inspiration comes at the end of page 3. Frequency: Daily for the first 30 days, then weekdays if you really need a break, but I write most days. Content: This is not a "journal" of your feelings, or a diary of what's going on in my life. This is a book of my ideas, thoughts, and plans for my business. Suggested topics: Your answers to the Top 10 Marketing Questions, exploration of your vision of success, more detailed exploration of your wants/don't wants from the Goals Exercises, what it feels like to help others with your product or service, copy for your web site, marketing messages, and so on. 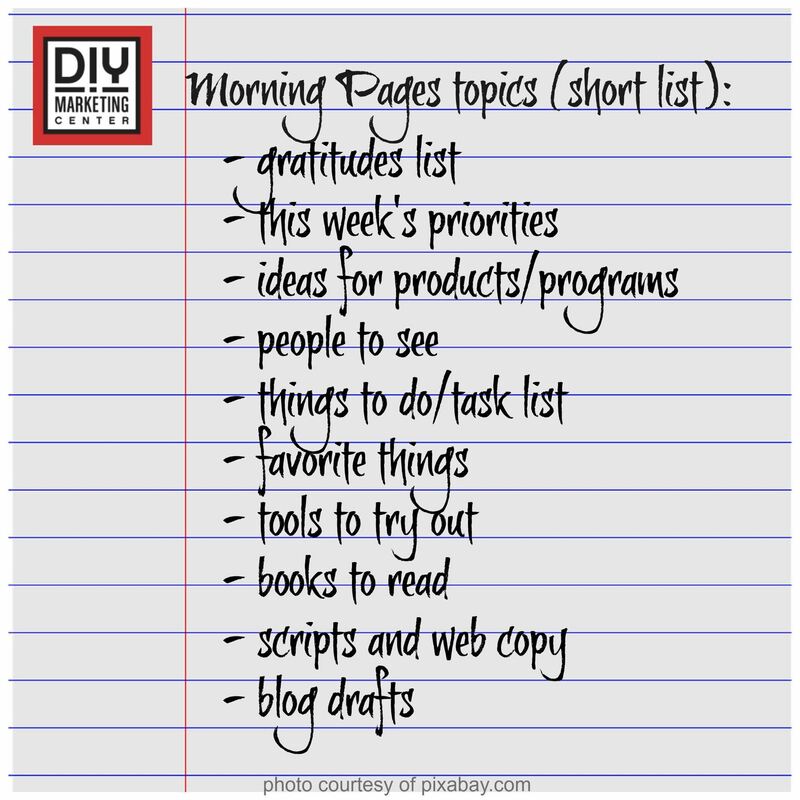 You may also find it helpful to create lists of things you plan to do for your business, information nuggets (like a Top 10 list) that you can use on your website as "sticky" content, a draft of your blog entry for the day, outline a presentation, etc. In general, this is a time dedicated to thinking and (more importantly) WRITING about your business. Fast start: I like to start by writing at least 10 things for which I am grateful (I call this list my "gratitudes") followed by thoughts, ideas, observations, lists, scripts, plans, tasks, processes, drafts, reminders, affirmations, outlines, brainstorms, mind maps, bubbles, priorities, questions, answers, problems, solutions, actions, results, summaries, and so on. Stuck: Write down five things that you’re grateful for, five things that you’re proud of, and wrap up with the top one to three results that you’re committed to creating today. © 2016 Veronika Noize. All rights reserved.